Here at The Exchange we are passionate about championing other independent local businesses. 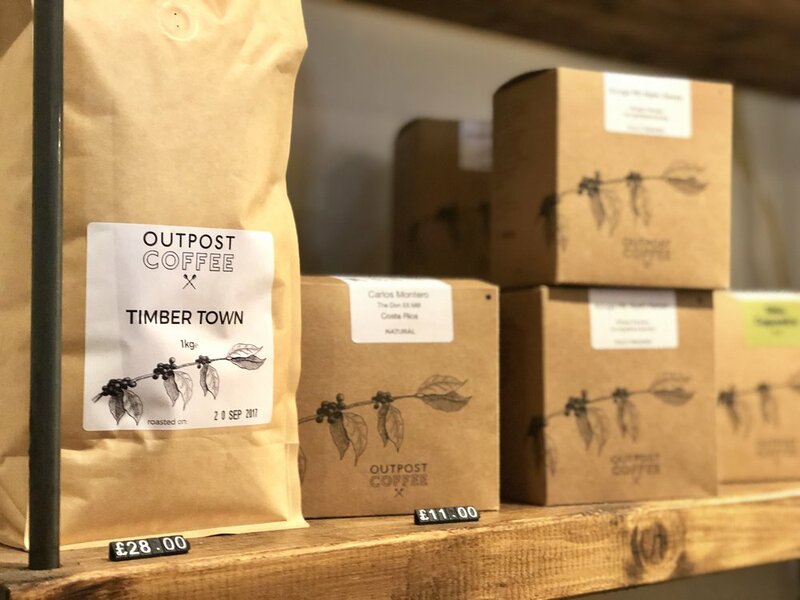 That's why Nottingham based Outpost Coffee Roasters have been supplying the bar with their delicious coffee since their launch last year. Outpost opened in July 2016 with only a shoestring budget. However the interiors are beautifully quant and quirky and they even made their own concrete bar slabs themselves, it looks fantastic! Outpost's key focus is about sourcing and roasting high quality coffee, providing training and sharing their passion for coffee. They also support local business, their milk is supplied from a local farm The Duffield Dairy and their cakes are from a local supplier. All of their coffees have been sourced from growers, who produce stand out arabica coffees and deserve better pay for their efforts. Outpost Coffee Roasters help support and maintain sustainable global supply chains that allow the growers to earn a consistent and good price for their crop. Well done guys! As we serve Outpost's high quality coffee at The Exchange we want our staff to be the best baristas they can possibly be. That's why Team Exchange headed over to Outpost Coffee Roasters in Nottingham to get trained in the art of coffee. The Outpost team invest their time in the training and development of industry professionals such as our lovely members of staff and many others. They support us with equipment selection and the knowhow to main the machines as well as teaching us the skills we need to make the perfect coffee. Alongside our varied selection of hot drinks at the bar you will find the tasty delights of Timber Town coffee. A satisfying traditional style coffee with chocolatey, jammy, butterscotch goodness, it's beautiful both as an espresso or great with milk. Outpost Coffee Roasters carefully roast the coffee by hand in-house in order to showcase it's true potential and you can truly taste it! Why not pop down to the bar and taste it for yourself..